Financing Our Foodshed, Growing Local Food with Slow Money by Carol Pepe Hewitt (broadcast 11-11-2013) Carol has a message for all about the value of of local, sustainably grown food and resilient local economies. The term foodshed describes the area where food is grown, the land it grows on, the route it travels to market and the tables it ends up on. Wanting to support enterprise that builds community by doing more than eating locally, lenders of “nurture capital”, in place of “venture capital”, are connecting to places where they live, creating vital relationships and sources of capital for small food enterprises. 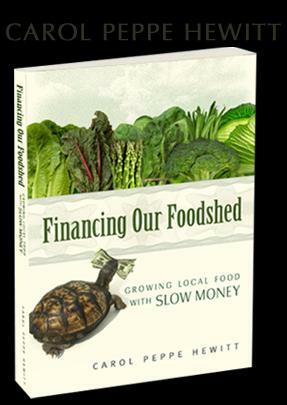 This book tells the compelling stories of ordinary people doing extraordinary things right here on our doorstep and offers a blueprint for becoming part of the Slow Money Movement aimed at bringing money closer to home starting with food. Find out more at financingourfoodshed.com.